Being an engaged community partner is often second nature for HHHunt team members. 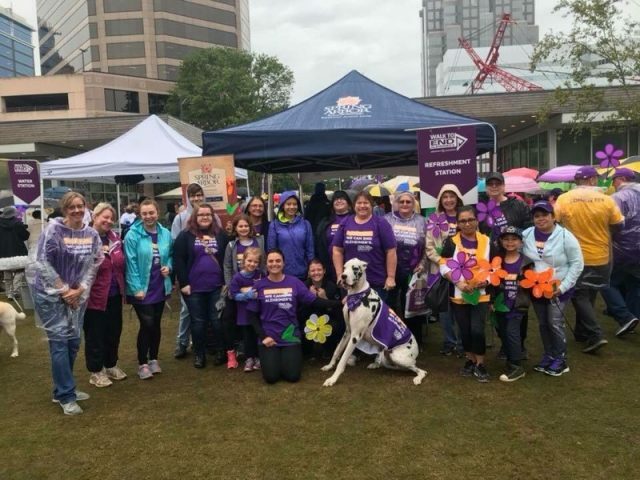 That’s why it came as no surprise when team members from our Spring Arbor of Greensboro community participated in the Guilford County Walk to End Alzheimer’s as they have for many years before. Walks to End Alzheimer’s are held throughout the country and many of our Spring Arbor communities participate in these meaningful events each year. When team members from Spring Arbor of Greensboro reached out in their community on behalf of the Walk, they encouraged 50 people to register and raised $3,800 for this very worthy cause. HHHunt’s Spring Arbor Senior Living and Spring Arbor Cottage communities are determined to put an end to Alzheimer’s and other dementia related diseases. Team members see the daily effects of Alzheimer’s and are passionate to bring awareness to the disease and raise funds to help find a cure. At HHHunt, we believe it’s how you live that matters and in our Spring Arbor communities, we pursue this belief every day. We understand the care and compassion needed to provide personalized support and attention to each of our senior residents and are committed to doing our part to help end Alzheimer’s. We are so proud of our Spring Arbor of Greensboro team members for helping to fulfill our vision of improving the world and how people live! Learn more about our Spring Arbor and Cottage communities by visiting our website. We also encourage you to visit the Alzheimer’s Association and consider supporting this incredible and worthwhile cause.